Always been fascinated about scuba diving but haven’t taken that plunge yet? Well, Planet Scuba India in Indiranagar will let you take that first plunge in the comfort of a swimming pool. 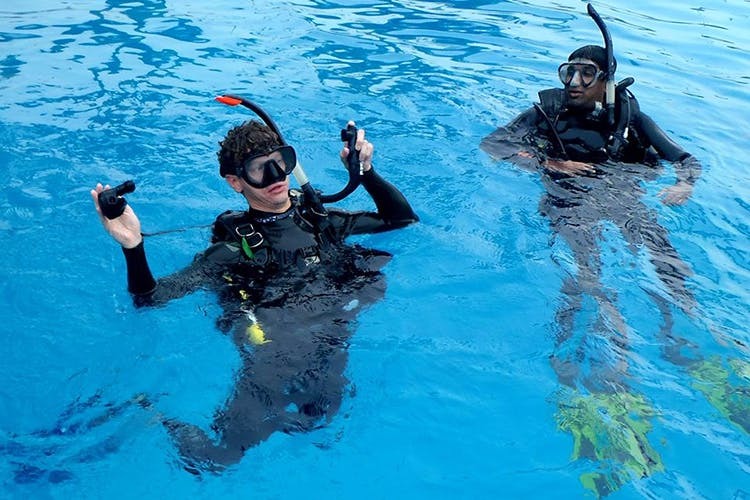 This Indiranagar scuba diving centre is a PADI (Professional Association of Diving Instructors) certified diving centre that lets you learn everything about scuba diving and certifying you on successful completion. Currently teaching Open Water Diver programme, this course is spread over four days with two days spent at Bangalore and the other two days at any sea destination across the country. The Bangalore leg of the programme is on weekdays or weekends with roughly three hours of theory and six hours of pool time spread over the two days. Once you have completed the Bangalore leg, it’s four open water dives at a sea destination of your choice. According to Planet Scuba, Goa is the most preferred destination followed by Netrani Island just off Murudeshwara. On successful completion of the four open water dives, you will be a PADI-certified scuba diver (woohoo!). A temporary license is issued that’s is valid for 90 days. The official license takes about three weeks time. Apart from the diving programme, the centre also sells all kinds of scuba diving gear from flippers to bodysuits and everything in between. They are a licensed reseller of Aqua Lung equipment. If you are already licensed, or once you get the license, these guys organise dive holidays. Mostly they head to Thailand, Malaysia, Indonesia, Maldives and the Red Sea, Egypt. Currently, holidays in Komodo Island (Malaysia) and Maldives are on the cards.